The PTS3E is designed for the manual control of suppository and pessary disintegration time. It conforms to the current requirements as laid down in the European Pharmacopoeia EP . 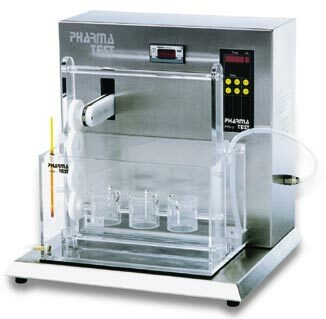 Three samples are tested simultaneously over a user selectable, pre-set period of 1 minute to 10 hours. The sample containers are rotated through 180°, as specified in the monograph. The water bath has a capacity of 12 litres (4ltr. for each of the samples). The total rotation time (for 180°) is normally 10 minutes, and the normal disintegration time is approximately 30 minutes. The bath, sample holder and test baskets can be removed from the instrument for cleaning. Due to the thermostat design (circulates from the bottom of the bath) it is made sure that no suppository material arrives inside the heating system.